What is BOTOX® COSMETIC 100 Units? Botox Cosmetic temporarily reduces the appearance of dynamic wrinkles in the upper facial area. It is administered intramuscularly to relax the muscles involved in creating moderate to severe forehead lines, crow’s feet, and frown lines. Botox Cosmetic is a neurotoxin that prevents the release of the neurotransmitter acetylcholine. In doing so, it produces a localized chemical denervation and subsequent reduction in muscle activity. This botulinum toxin treatment is uniquely formulated; it consists of large, uniform ~900-kDA complex molecules made of both a 150-kDA core neurotoxin and its accessory proteins. 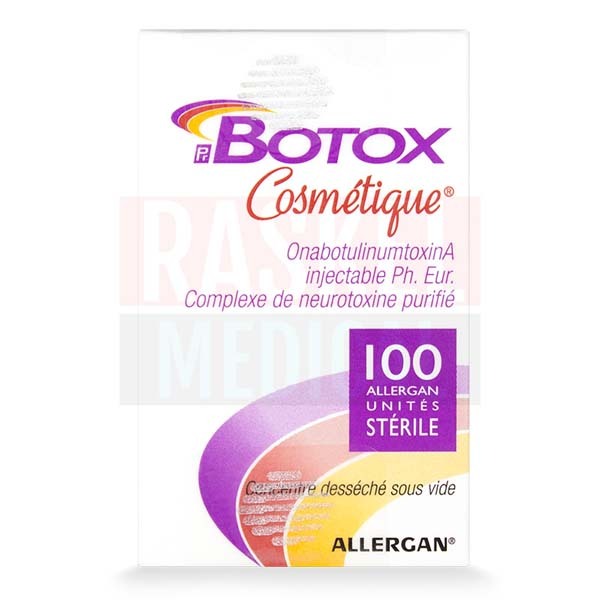 For this reason, Botox Cosmetic units are not interchangeable with other botulinum toxins. 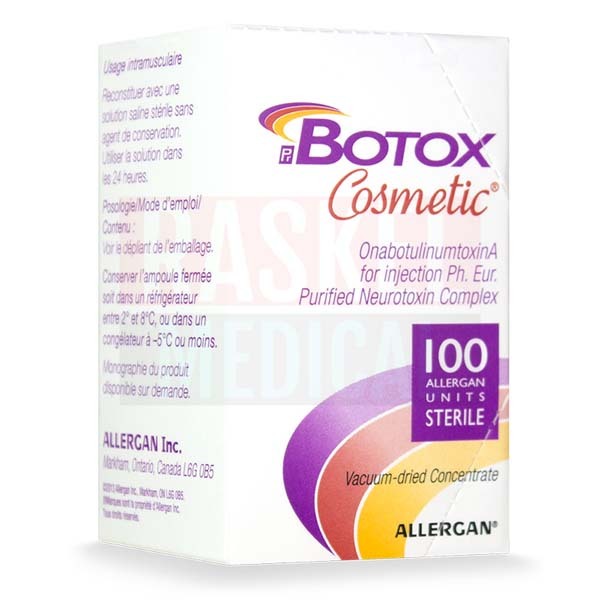 Botox Cosmetic is a product of Allergan Inc., a global provider of medical aesthetic solutions. As with all botulinum toxins, Botox Cosmetic may result in symptoms that occur distant to the injection site. These symptoms arise due to the spread of the toxin from the treatment area, and can occur hours to weeks after the injection. These adverse effects, which include difficulties in swallowing, speech or breathing, can have serious and potentially lethal consequences. If your patient notices any of these symptoms developing, they should seek immediate medical help. Anticipated injection-related reactions that may occur include pain, bruising or tenderness at the site of the injection. Such reactions are mild and will usually resolve on their own within a few days. Other rarer, but potentially more serious, undesirable effects include malaise that can last up to 6 weeks post injection, weakness, skin rash and allergic reaction (symptoms include swelling of the face, lips, tongue or other parts of the body; shortness of breath, wheezing or difficulty breathing; rash, itching or hives on the skin), respiratory compromise, seizures, facial paralysis, and cardiovascular events, including arrhythmia and myocardial infarction in patients with risk factors (e.g. cardiovascular disease). 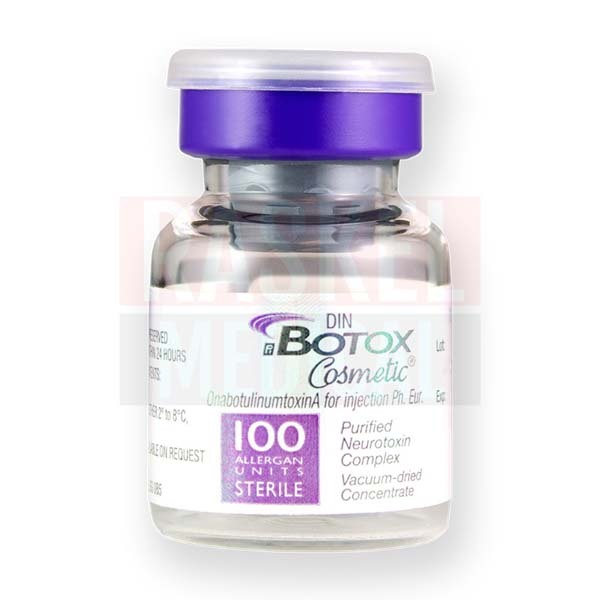 This botulinum toxin injection is suitable for all skin types but is particularly suitable for aging or mature skin to improve the appearance of upper facial wrinkles. This product is lyophilized and supplied in vials. Administer the reconstituted product using a sterile 1.0ml tuberculin syringe with a 1.5”, 27G electromyographic injection needle. Botox Cosmetic has FDA approval for the indications of moderate to severe forehead lines, lateral canthal lines, and glabellar lines in adults. Botox Cosmetic should only be given by a physician with the appropriate qualifications and experience in the treatment and the use of required equipment. Prior to administration, reconstitute the lyophilized product by adding the appropriate amount of diluent (0.9% sodium chloride injection) to the vial, diluting the product to a concentration of 4.0 units to 7.0 units per 0.1ml. The reconstituted product should be clear, colorless and free of particulate matter. Prepare the area to be treated by cleansing and disinfecting with a suitable antiseptic. Using a suitable syringe and needle, draw up the recommended volume of Botox Cosmetic and inject as per the recommendation for each indication. Glabellar lines: Administer 4 units using a 30G needle in each of 5 sites, 2 in each corrugator muscle and 1 in the procerus muscle for a total dose of 20 units. Forehead lines: Inject 2 to 6 units at each of 4 injection sites in the frontalis muscle, every 1–2cm along either side of a deep forehead crease, 2–3cm above the eyebrows, for a total dose of up to 24 units. Lateral canthus lines: Inject 2–6 units bilaterally at each of 1–3 injection sites at a 2–3mm depth, lateral to the lateral orbital rim, where most lines are seen when a smile is forced. Ensure that the injection is at least 1cm outside the bony orbit, not medial to the vertical line through the lateral canthus, and not close to the inferior margin of the zygoma. 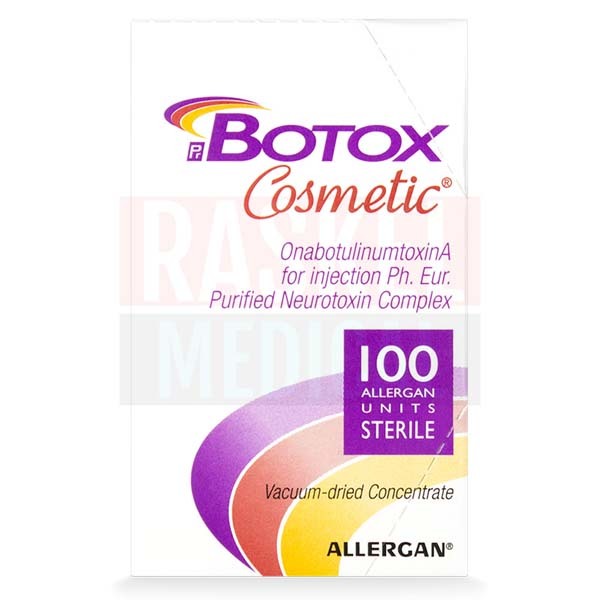 Botox Cosmetic is supplied in a preservative-free vacuum-dried form. The medication contains Clostridium botulinum toxin type A neurotoxin complex (900kD) in 100 Allergan Units (U) together with the inactive ingredients human serum albumin and sodium chloride. A single Allergan Unit corresponds to the calculated median lethal dose (LD50) in mice using the reconstituted solution in intraperitoneal injections. Patients can expect the results of treatment to last about 3–4 months. Store in a refrigerator with the temperature set between 2°C to 8°C. Do not freeze or reuse reconstituted Botox Cosmetic. If there is any remaining solution, discard it. Botox Cosmetic has a shelf life of 24 months if stored in the refrigerator (2-8°C). Reconstituted solution should be used within 24 hours. Do not use if the product has expired.